Well, after many years of preparation and training, we are finally here in Papua New Guinea. Way too much has happened in the month since we left the States to update you on all of it, but it you want a snapshot of our lives here, I suggest you check out our ministry page on Facebook. The only problem is that when you look at all of the beautiful pictures of gorgeous sunrises, natural caves, hidden spring-fed pools, and lush jungle, you might leave with the impression that we’re on an adventure filled vacation. But life is not all sunshine and roses. It often rains, and when it does, it pours. There are many wonderful things about living in a new culture, but the fact remains that adjusting to a completely new lifestyle takes a toll on you–physically, mentally, and spiritually. In addition to the physical demands, there are plenty of mental stressors, too. In the absence of local trash pickup, we are discouraged from using disposable paper and plastic goods. You don’t realize how dependent you are upon trash pickup until you’re forced to switch to cloth diapers (which must be hand washed…😳) and have to try to figure out alternatives to Ziploc bags and paper towels, which are nowhere to be found. When your kids are adjusting to new foods (read “explosive diarrhea”), cloth diapers can be the thing that just ruins your day. It seems like every other morning we wake up and the first thing we have to do is change diapers and wash bedding. It’s not a pleasant start to the day. On top of this, when you’re living is such close community with people you’ve just met from all over the globe, there are cultural stressors even amongst your fellow missionary colleagues. Add to that the exhaustion of spending hours a day learning a new language, making new friends, and learning the culture of the people to whom you minister, and even days which are physically less stressful can get the best of you. Lastly, there’s the spiritual stress. You don’t realize how refreshing your Sunday church service is until you’ve sat through an entire service in a foreign language and only understood several words here and there. After a long, physically and mentally draining week, you look forward to the spiritual refreshment of Christian music and teaching, only to find yourself straining to understand bits and pieces of the sermon, and not recognizing any of the songs that are sung. Church service becomes just another culture and language learning session leaving you more exhausted than you were before. The Holy Spirit may be alive and well in the church you visited, but the spiritual truths of God’s Word are locked behind the gate of a foreign language and culture, inaccessible to you. One positive takeaway from this experience, however, was being able to empathize with the many people who attend service every week in PNG in a language that is not their mother tongue, read scripture in a language that is not their mother tongue, and sing songs that are not from their culture or language. It gives me a greater appreciation for Bible translation and mother tongue scripture use. In addition to the stress of cross-cultural church attendance, Satan is no fool when it comes to wartime strategy. If the Word of God is the Holy Spirit’s weapon, then those who advance the Word of God through ministry, missions, and/or Bible translation are spiritual weapons dealers. We endeavor to supply people with the very weapon the Holy Spirit uses to vanquish Satan…which puts a giant bull’s-eye on our backs. Indeed, since we’ve been here, we’ve noticed a sharp increase in spiritual warfare. Kids have had bad dreams, seen apparitions, and there have been various illnesses that just won’t go away. Satan doesn’t play fair, so unfortunately, it’s often the kids that get the brunt of the attacks. Satan is no match for God’s power, but Paul still describes the fight as a “struggle” for us. Of course, as a missionary entering the field for the first time, all of these stressors (and many more!) hit you all at once. When it rains, it pours. The stress of adapting to all of this change while struggling to be a good spouse, parent, student, and minister can be crippling. Then it started raining–really raining, not just meataphorically raining. We were supposed to go to the beach today. Now you might be thinking, “What a bummer!” But actually, the rain was just what the doctor ordered. See, a trip to the beach here is no mere vacation in the sand. It’s a big ordeal, especially with kids. There’s all the normal preparation of swimsuits, sunblock, last minute (cloth) diaper changes, etc., but then there’s also a very bumpy 45-minute drive down the mountain in the back of a packed truck with 50 other people. Then there’s baths for kids and the inevitable rush to the bucket-showers, and the long wait in line for your turn at one of the three showers in each bathroom which serve over 50 people. After a long stressful week, I was not really super excited about the beach trip. So it rained. Rather, it poured. One of those relaxing tropical rainforest monsoon-season gully-washers. So, the beach trip was cancelled. I wasn’t terribly disappointed, though I did feel bad for the kids at first. But, as I watched the rain, it felt as if God was washing away all of the stress of the past week. 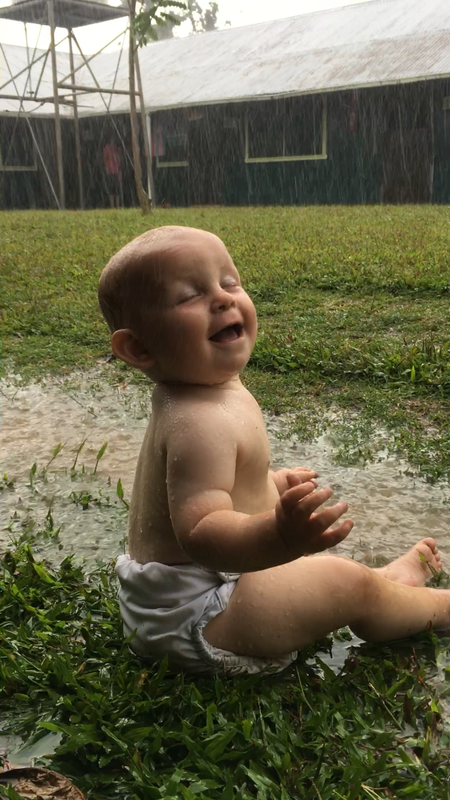 The kids all made the best out of it and had a blast playing in the rain, throwing water from the downspouts all over each other, and rolling in the mud puddles. (Missionary kids, or “MKs” as we call them, are a creative bunch!) Turns out, most of the other parents weren’t thrilled with the idea of a beach trip either, so in the end, God provided just what everyone needed–rest for the adults, and water to play in for the kids. He brought the beach to us, all the way to the top of the mountain. 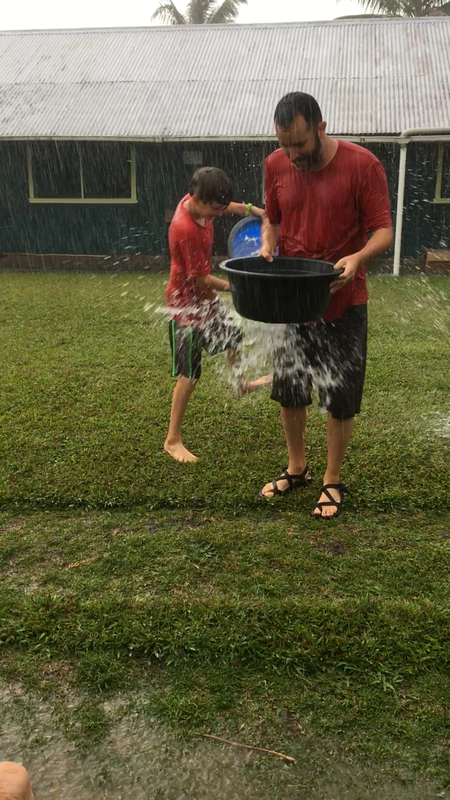 Some of the kids at POC playing in the rain with their dad. God provided just what I needed to get through the day. A couple weeks ago, I wrote a post entitled Don’t Give Up. As Christians, sometimes we can get discouraged by what we see in our churches. When we look at the church in America, we don’t have to look far to find problems. Discipleship is shallow. Evangelism is ineffective or lacking altogether. Conversions are in decline. Population growth is outpacing the growth of almost every evangelical Christian denomination. Many, many churches are permanently closing their doors every year. It’s easy to loose hope, to give up. A couple weeks ago, that’s exactly where I was. Discouraged, frustrated, ready to give up. And that’s exactly what Satan wants. You see, our enemy doesn’t fight fair. He abides by no rules of conduct, no Geneva convention, no gentleman’s code. He fights dirty. He doesn’t march out in phalanx formation like the ancient Romans. He doesn’t wait for his turn to take a volley like the Red Coats of the Revolutionary War. He doesn’t even wear a uniform to distinguish himself from his enemies. No, he uses much more covert means of warfare. He waits in ambush under cover of darkness. He picks of the weak and wounded stragglers who are too weary to keep up with the herd. He turns brother against brother, friend against friend, believer against believer. And when he has succeeded in sowing discord, strife, and bitterness in believers, he divides and conquers. Satan has an unfair advantage…you can’t see him. He sneaks around with his “invisibility cloak” taking cheap shots at unsuspecting believers. And when these believers turn and fire, they realize all too late that he was hiding behind another believer. Friendly fire is one of Satan’s most successful methods of defeating the church. We don’t realize until it’s too late that it wasn’t our brother or sister in Christ that made that rude, hurtful comment or who sloughed off their church duties, but Satan whispering lies into their ears. I think that one of the reasons we get so discouraged and frustrated with fellow believers and our churches is that we mistake friend for foe. We begin to think of people as the enemy, or the obstacle, to our church, and we treat them, instead of the true enemy, as hostiles. Such has been Satan’s ploy against me for a few weeks. I began to focus on the problems. I began to see my fellow believers as hostiles. By the grace of God, as I was poised and ready to open fire, God began convicting me of the spiritual attack that I was under. Then it hit me: why did I feel like I was under such heavy spiritual attack? Because Satan only bothers attacking those he deems a threat. I couldn’t see how I–or our tiny little church–could be deemed a threat, but it gave me some courage to continue on. Prior to this revelation I had begun to become so discouraged that I had considered cancelling the next upcoming youth event: the Winter Jam concert. I justified this decision with all kinds of rational sounding excuses. “We don’t have enough adult volunteers–we’ll loose the kids in the crowd of thousands of people.” “Their not old enough to benefit from the experience.” “Neither the kids nor the church can’t afford it.” But, God revealed my bad attitude to me, and I prayerfully decided to go ahead with the concert. The kids were extremely well behaved. I had two adults step up to volunteer. It turned out to be cheaper than expected. Two of the kids from the youth group were so moved by the presentation by Holt International (an international adoption agency) that they decided to sponsor a child awaiting adoption in Ethiopia as a youth group. And best of all–one of the kids was saved that night. Is your church under spiritual attack? Are you harboring bitterness and resentment toward a fellow believer? Have you been deceived by the enemy that your efforts are in vain? God is not mocked. Keep up the good fight and recognize Satan’s ploy for what it is. It’s all worth it if there’s just one who comes to know Christ. When I look back at my attitude a couple weeks ago, I can only thank God that he did not allow me to persist in my plans to cancel that concert trip. While I certainly can’t take the credit for what happened that night (without the Holy Spirit’s conviction, nothing would have happened! ), I can say that my obedience to Christ’s calling did put those kids in the right place at the right time for the Holy Spirit to do his work. One girl can now rest assured of her eternal destiny, and a little boy halfway around the world is experiencing the overflow of the love of Christ expressed by changed hearts here in our little church. What a blessing it is to be the vessel God uses to accomplish his great plan. Who knows how far the ripples will continue? So if you are under spiritual attack right now, take heart! Your obedience is NEVER in vain. You may not see the fruit right now, but in due season you will reap, IF you do not give up.